Have a 1944 wheat penny and want to know its value? Maybe you have a 1944 penny silver in color and wonder if it’s that rare penny you’ve heard about. Perhaps you have a bunch of 1944 pennies and want to know if it’s worth taking them to a coin dealer to sell them. If you’ve got questions about 1944 wheat pennies, you’ve come to the right place — because we’ve got the answers! It’s time to find out if you own the $100,000+ 1944 steel penny, or if your 1944 Lincoln cent is worth just 3 to 5 cents. The 1944 Lincoln cent is one of the most common wheat pennies, which were minted from 1909 through 1958. More than 2.1 billion 1944 pennies were struck at the Philadelphia, Denver, and San Francisco Mints combined — and virtually all of these one-cent coins were made from copper. Wheat pennies from the mid-1940s differ from most other wheat cents. 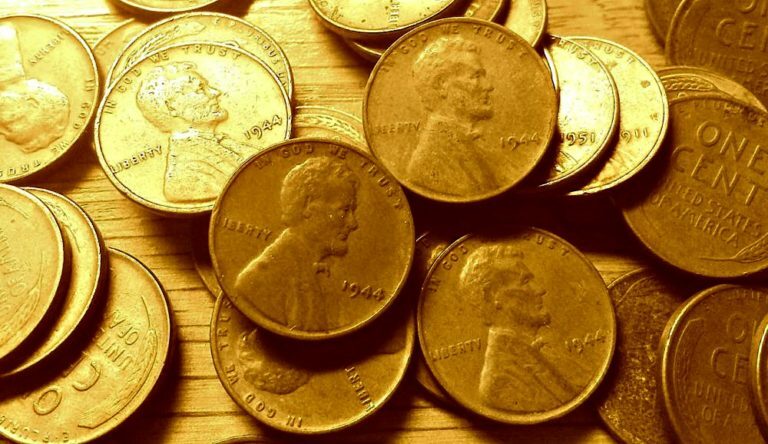 While Lincoln wheat pennies were traditionally struck in a 95% copper and 5% tin and zinc, those made from 1944 through 1946 were struck on planchets consisting of 95% copper and 5% zinc. Because the copper used in the 1944 through 1946 pennies were made from recovered ammunitions shells used in World War II. In 1943, the Lincoln penny was made from a zinc-coated steel composition to help save copper for World War II ammunitions. However, many people mistook the 1943 steel penny for a dime, and others complained about the steel becoming rusty. 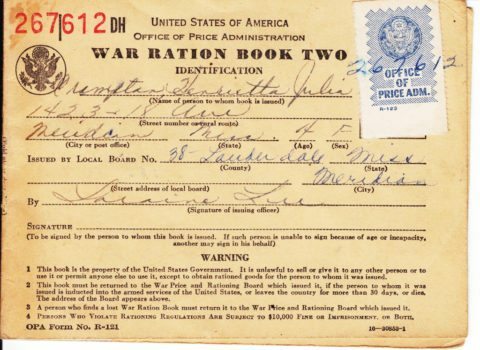 Responding to the public outcry during a time of rations, officials in the U.S. government decided to return to using copper in the penny beginning in 1944 — choosing to derive the copper from spent shell casings. What About That Rare 1944 Steel Penny? Even though the United States Mint switched pennies from a steel composition to copper in 1944, some steel planchets were left behind in the presses, presumably by accident. This resulted in the creation of perhaps less than 2 dozen or so 1944 steel pennies — fewer than the similar, yet converse error that resulted in the minting of about 25 copper 1943 pennies, also considered a great rarity. Many folks call them 1944 silver pennies, but there is no silver in the 1944 cent. They’re zinc-plated steel, just the same as the 1943 cent. A lot of collectors get excited when they find a silver colored 1944 cent — thinking they found the rare 1944 steel penny. But in virtually every case, what they have are silver-colored 1944 copper cents. If your 1944 penny sticks to a magnet, it’s a steel cent and is rare. If your 1944 penny does NOT stick to a magnet, it’s made from copper and is common. If they measure in at 3.11 grams each (more or less), they’re of the ordinary copper variety; 1944 steel pennies weigh 2.7 grams. If you have a 1944 penny that’s silver colored, looks like it’s made from steel, is magnetic, and weighs about 2.7 grams, it’s worth having it certified by a 3rd-party coin authentication service to determine if you have a real 1944 penny! Besides the metallic composition of the coin, what’s the biggest difference between a 1944 steel cent and a 1944 copper penny? The value. Read on to see the huge spread in price between a common, worn 1944 penny and any 1944 steel penny. What Are 1944 Pennies Worth? So, what’s the difference between the value of a regular 1944 copper penny and a 1944 steel penny? More than $100,000! *Values are for coins in average circulated condition. What Else Happened When Your 1944 Penny Was Made? World War II was happening in 1944, and hundreds of millions of people were reading newspaper headlines and tuning into radio newscasts to stay current on the latest from the battle lines. On June 6, more than 150,000 allied troops stormed the beaches of Normandy to free Western Europe from the German Nazis. Operation Overlord, more widely known as D-Day, was the biggest military operation of its kind in history. President Franklin Delano Roosevelt signed the GI Bill — which offered a variety of financial and social benefits for military personnel. Paris was liberated from Nazi control. Meet Me In St. Louis and Arsenic And Old Lace were among the top films on the silver screen. A new house cost $3,450, the average American earned $2,400 per year, gas was 15 cents per gallon, and a loaf of bread sold for 10 cents. Why Are 1943 Copper And 1944 Steel Penny Errors So Valuable?